Do you want to be able to understand and speak the Arabic of the Arabian Gulf confidently? All you need is this bestselling course from Teach Yourself - the most trusted brand in language learning. This course teaches the spoken Arabic of the Gulf region through everyday real-life situations that make the grammar and vocabulary easy and memorable, alongside full online audio support. 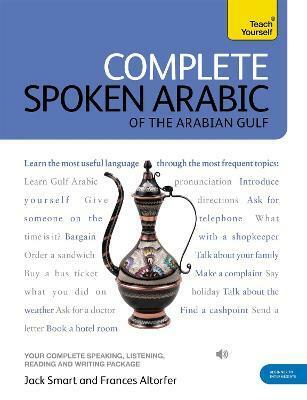 To learn Modern Standard Arabic - used in writing and formal situations throughout the Arabic-speaking world - pick up a copy of Complete Arabic (9781444105469), also from Teach Yourself. Complete Spoken Arabic (of the Arabian Gulf) is structured in thematic units and the emphasis is placed on communication, so that you effortlessly progress from introducing yourself and dealing with everyday situations, to using the phone and talking about work. By the end of this course, you will approach Level B2 of the Common European Framework for Languages: Can interact with a degree of fluency and spontaneity that makes regular interaction with native speakers quite possible without strain for either party. 04: What time is it? 05: How much is this? Do you want to undersrand and speak the Arabic of the Arabian Gulf confidently? All you need is the bestselling book from teach Yourself - the No. 1 brand in language learning. This course teaches the spoken Arabic of the Gulf region through everyday real-life situations that make grammar and vocabulary easy and memorable, with complete audio support MP3 compatible. Jack Smart was Lecturer in Arabic and Islamic studies at the University of Exeter before retirement. Frances Altorfer is a modern languages teacher in secondary education. [Pick up level indicator from Complete courses and B2 reference box:] By the end of this course you will be at B2 of the Common European Framework (CEFR) for languages: Can interact with fluency and spantaneity and produce clear, detailed text on a wide range of subjects and to explain a viewpoint. Frances Altorfer was a modern languages teacher in secondary education.